Today I was reminded about what a gift it is to have the passion of a collector. Whether you collect art, vintage Hollywood, sports or comic books, Collectors know they always have a "special place" they can go when the world seems so dark. Over the past week (or several months come to think of it) I find the media to be a reliable source of misery. I would never have believed that CNN and Fox news would become my last choice for evening Television. Yet, not even the persistent, gloomy economic and political news can dampen the excitement of collecting. That's what makes collecting more then just a hobby. It's an escape to a better, healthier state of mind. To me that is priceless. I call it "the Collector High". It 's unfortunate there are so many people that have no better place to go to as these ominous clouds shower us with this temporary dismal and pessimistic economic storm. Nevertheless, I was saddened this past week, on another dimension, while reading my email. I see a news report that one of our most beloved movie actors Paul Newman had succumbed to cancer. I didn't know Paul Newman, never met him. I only knew the public, bigger then life persona. But, he played an important role in my early life. When I was about ten years old, I acquired a love for old movies and in particular three movie legends, namely James Stewart, John Wayne and Paul Newman. Because there was also a very public side of this man, who exhibited an authenticity, a pureness that is about as contrary to typical Hollywood fame as Freddy Krugger helping an old lady across the street, we all got to know him a little bit. His philanthropy, his one-in-a-thousand long term, loyal Hollywood marriage, and his numerous charitable contributions, that didn't require photo ops and career boosting propaganda are well known. This was regardless of how hard he tried to live an anonymous life on the opposite side of the elite coast. In a Hollywood culture where reality is disguised by vanity, materialistic wealth and endless symbolic identity. Here was an actor who achieved Hollywood's highest fame, but turned his backed on the dark, ugly side of movie stardom. He was a self proclaimed anti-celebrity and often referred to acts of celebrity as offensive. He truly knew WHO he was.. Here is an excerpt from USA Today. Now this rare breed of handsome rascal who connected with audiences across five decades is gone. The screen legend died Friday after a long battle with cancer at his farmhouse near Westport, Conn., publicist Jeff Sanderson said. He was 83. The actor was surrounded by his family and close friends, including his wife of 50 years, actress Joanne Woodward. Not even a Brad Pitt or a George Clooney could take Newman's place. You would have to mix the DNA of both Clint Eastwood (the steely toughness) and Robert Redford (the manly allure) to come close to duplicating him. 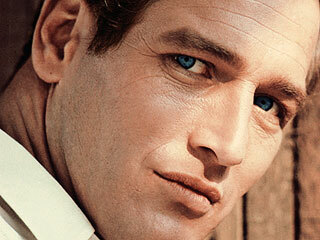 As Clooney himself told Men's Journal in 2000, "Nobody gets to be famous as long as Paul Newman. You can't take your eyes off of him. He's always interested in the scene, as opposed to trying to be interesting." The blue-eyed devil considered himself more lucky than talented to have the career he achieved. So, this afternoon, with anxiety about this financial crisis we face and little comfort from Washington, I am distracted by comforting thoughts about a memorable actor whose performances never failed to take me to a better place. I recall as a ten year old, in the fifth grade, reciting that unforgettable, scolding quote from "Cool and Luke", "what we have here is a failure to communicate". Why my early heroes were James Stewart, John Wayne and Paul Newman, I can't explain, but in hindsight, not bad judgment for a 10 year old boy. Whether it was Hud Bannon in Hud or Luke in Cool Hand Luke, Paul Newman never had a failure to communicate. Thanks Paul for the memories and allowing us to go to a better place when the media and politicians are trying to convince us that money is the end of the world. I looked at many sites, but this one is in a league of its own. Great merchandise and customer service. Look no further for vintage memorabilia.